It's been an exciting winter at the Born Free USA Primate Sanctuary! We've been busy as ever, attending to the more than 600 monkeys in our care. It's constant work, but it's also rewarding. These monkeys rely on us, and we do everything in our power to give them the healthy, social lives that they were sadly denied prior to their arrival at the sanctuary. Whether confined to a research lab or to a cage in someone's garage - deprived of the warming sun on their faces, grass beneath their feet, proper nutrition, and the companionship of other monkeys - they had never experienced the quality of life intended by nature. I often think about how their prior lives must have felt for them. Discomfort, pain, fear ... and such boredom. Primates, of all species, are highly intelligent, active, and curious. These attributes are expressed in a number of different ways, but boredom is perhaps the most telling sign of intelligence. It indicates a capacity for mental stimulation that is, unfortunately, unmet. Primates who live natural lives in the wild are involved in an exciting, dangerous, and fulfilling world from the moment they are born. As they mature, these incredible beings spend every moment of the first few years with their mothers, each segment in time immersed in rich sensory input. Clinging to thick fur and pressed close against a warm body, the youngsters are continuously taking in important information. They stare wide-eyed as a strong male defends the troop, and then shrink against their mothers' bodies when a higher ranking female shows her disapproval. They learn the alarm calls of their closest relatives and, by example, learn what is good to eat and what is not. They develop incredible acrobatic skills as part of their daily activities, and sometimes, their very survival depends on it. 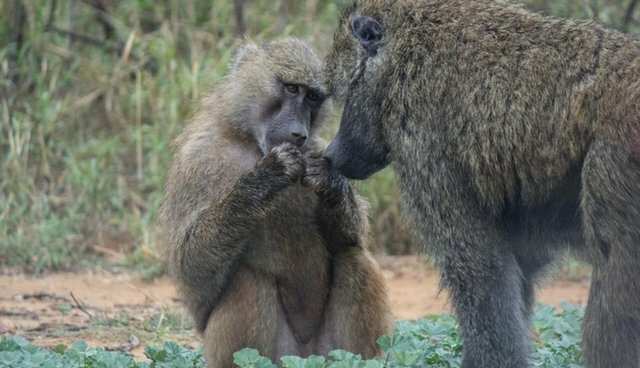 When you see pictures or videos of primates living in the wild, without human influence, you see animals truly engaged in their environment and free from unnatural stress. They are immersed in their lives, living each moment to the fullest. That is truly the essence of a wild life. But, things change dramatically, and not for the better, when our wild cousins are utilized in research or entertainment, or are forced into a life as a pet in someone's household. For them, every natural instinct has been suppressed. They don't mature with their mothers' fur grasped in their tiny hands, and they don't have the troop's wisdom to guide them. Instead, they are kept in steel cages or wrapped in human clothes and fed human food, most often without ever seeing another of their own kind. Those raised for the pet trade suffer an even greater tragedy, as they are stolen from their mothers at only a few days old. You will likely never see a wild primate bite himself. You will never see a normal, wild macaque spin in circles while trying to remove his own foot. You will never see a wild primate huddle in a corner, chewing on his arm. But, these behaviors are common in those raised unnaturally by humans who confine them. Denied a natural upbringing, along with a lack of consistent and natural enrichment, they lead lives of frustration and boredom, which adds to an already damaged psyche. This frustration must have an outlet, and they learn to cope with their anxiety by biting, spinning, pulling hair, and other unnatural behaviors that serve to release stress. For our sanctuary primates who have come from unnatural and often abusive situations, the damage has been done. The most healing thing we can do is provide them with an enriched environment and, hopefully, the company of another monkey. To see Gilbert run across the enclosure and then wrap himself in a blanket is both heartbreaking and heartwarming. When Natalia and Nigel play tug of war with a wet towel, we see their eyes light up with excitement. When Amiya climbs a tree and spends an hour playing with a baby rattle, we see her intense focus. And, when we see blind Patty gently pull a fragrance-soaked blanket to her face and revel in her other senses, we glimpse the intelligence and richness inherent in the lives too often taken for granted.